Our boutique accommodation offers elegant high set tropical treehouses privately situated on the bank of a crystal clear creek surrounded by rainforest. Immerse yourself in the timeless grandeur & splendid isolation of the world's oldest living rainforest from the comfort of your air-conditioned cabin, explore the natural wonders and flora & fauna of the tropical jungle and experience award winning eco-tourism. Black Palm Cape Tribulation accommodation with its 5 star location is your perfect romantic getaway, totally private honeymoon or luxury anniversary retreat in the Daintree. Cape Tribulation is in the heart of the world's most ancient rainforest and the place where two World Heritage areas converge - a place where the Wet Tropics Daintree rainforest meets the Great Barrier Reef. A 2.5hr drive from Cairns on the coastal road will bring you to this paradise to enjoy palm fringed tropical beaches, lush rainforest and cascading creeks. Read our Reveiws here or for more information on the Daintree visit our Explore page or visit Destination Daintree. This is a beautiful time of the year to visit with the rainforest lush, green and thriving in the high rainfall, the swimming holes & creeks full and increased wildlife activity. This is the time of year when you’ll get to see the Giant Golden Orb weavers and hear the chorus of hundreds of frogs celebrating the rain. The drive to Cape Tribulation is spectacular with numerous temporary waterfalls and cascading creeks along the roadside which can only be experienced at this time of year. Typically during the Green Season, we experience days and nights of heavy rainfall interspersed with sunny days and it is very hot and humid – if you want the authentic rainforest experience, this is the season for you! 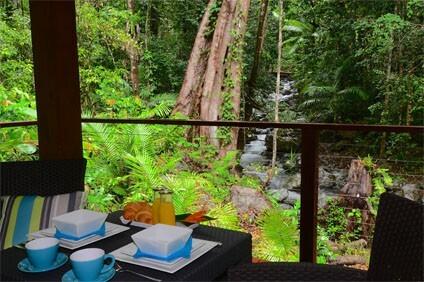 If you are not from the tropics, you will probably want to take full advantage of the air-conditioning in the Black Palm villa in between your explorations of the Daintree rainforest! 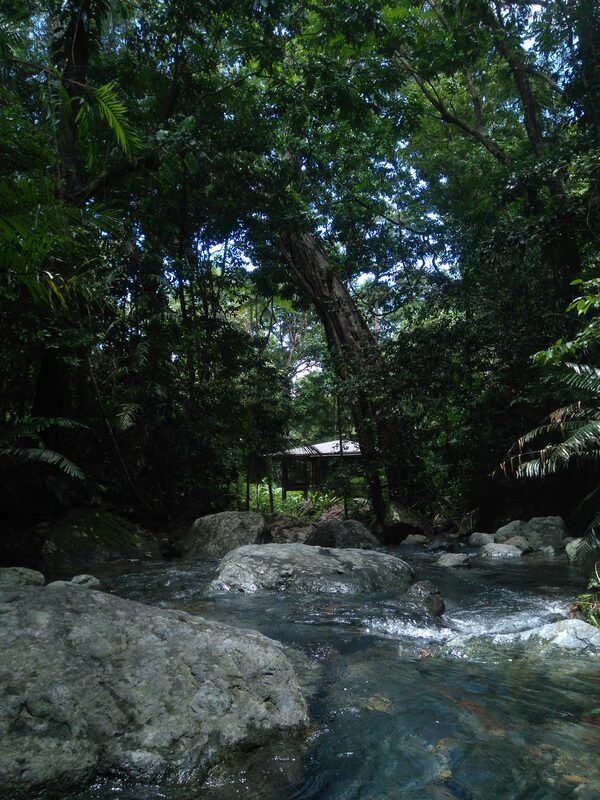 The creek view from the Black Palm cabin is at it’s best during the Green Season. You may experience instances of flooding during heavy rain, especially in February & March (typically the wettest months) which is spectacular to watch but the sheer volume of water cascading over the rocky creek bed can be rather loud when experienced from the undercover deck. Once you retreat inside the villa, the wall to ceiling acoustic glass provides a quieter environment whilst still allowing you to appreciate the stunning views of the rainforest and flooded creek! The Green Season is generally a lot quieter for tourism and sees greatly reduced visitor numbers especially in February & March – you are likely to have the beaches and swimming holes to your selves. Because of this, some local restaurants, shops and tour operators choose to close their business or operate reduced hours of service. At this time of year with dining out options limited, you may appreciate that Black Palm is also self-contained accommodation. By April the weather is cooling, general rainfall is easing and local restaurants, shops and tour operators are back to normal operation. This is also a great time of the year to visit the Daintree. The rainforest is usually still fresh and vibrant after the green season and this time sees reduced rainfall, temperature and humidity making it more comfortable than the Green Season for most people. If you are visiting from a place outside of the tropics it will still feel warm and even sometimes humid! The Black Palm creek is mostly a gentle flow through this time providing a lovely babbling creek background sound to relax the senses. June to September is the peak tourism period and sees increased numbers of visitors to the area and many businesses operate at capacity during this time, so make sure you book your tours in advance to avoid missing out. August & September is the most popular time of year to visit with the balmy tropical days and cooler nights making for the perfect climate for most visitors. The warm dry weather makes for picture postcard days but the humidity is creeping higher by the end of October. Most years sees the forest looking dry, dusty & thirsty with the creeks and swimming holes having lesser volumes of water. The Black Palm creek is slowing to a trickle at this time of the year. Hot and humid but well worth visiting! This time of the year is building up to the Green Season again with storms often heard rumbling in the distance to the west behind the Great Dividing Range or sometimes making it over the mountains bringing welcome rain to the dry forest! 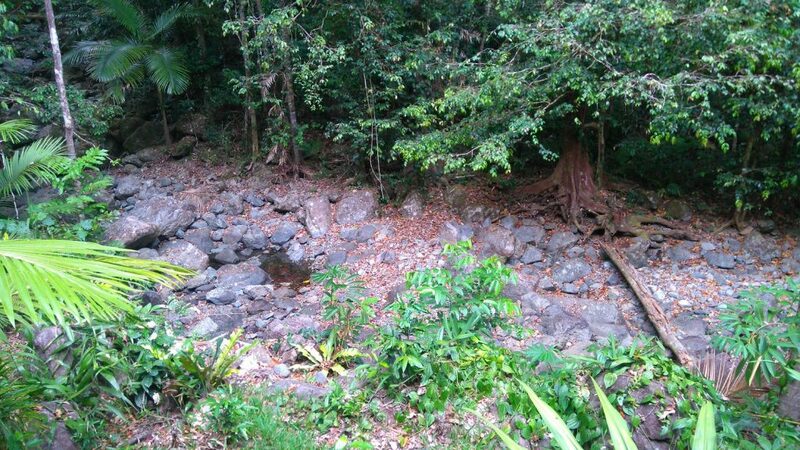 Our creek is sometimes completely dry outside the cabin and only a few deeper waterholes further up the creek hold any water. Some years the storms arrive early in the season and deposit enough rain to start our creek flowing again or keep it flowing in the wetter years! This can be a spectacular time to be staying at Black Palm if you happen to stay when the first rains after the dry are imminent. One or two days prior to the first rains, lucky guests may experience the spectacular light displays of fireflys along the creek and in the rainforest . The downside to this time can be the almost oppressive humidity – especially after rain when the sun comes out again! A cold drink sat under the ceiling fan on the deck is the ideal way to experience to forest at this steamy time of year or retreat into the air conditioned comfort inside! No matter what time of the year you visit, we are sure that you will find Black Palm Cape Tribulation the perfect Daintree rainforest accommodation for your North Queensland holiday.